Now, researchers at MIT have explored the secrets behind these shells' extraordinary impact resilience. 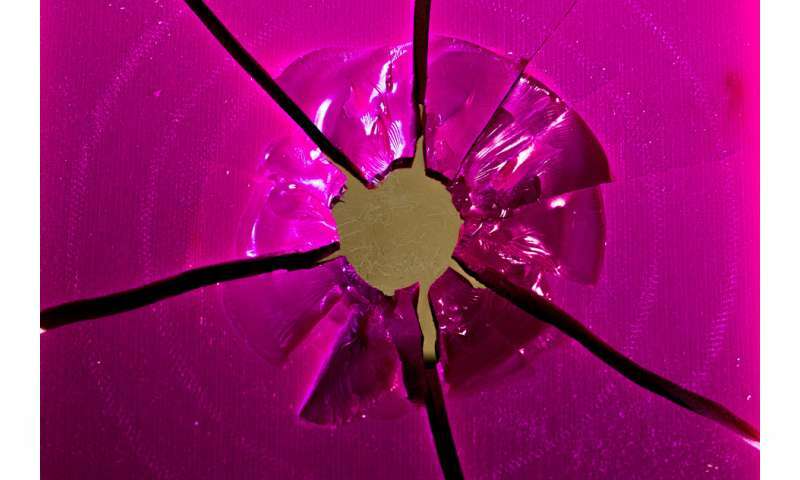 And they've shown that this superior strength could be reproduced in engineered materials, potentially to provide the best-ever protective headgear and body armor. The findings are reported in the journal Advanced Materials, in a paper by MIT graduate student Grace Gu, postdoc Mahdi Takaffoli, and McAfee Professor of Engineering Markus Buehler. Conch shells "have this really unique architecture," Gu explains. The structure makes the material 10 times tougher than nacre, commonly known as mother of pearl. This toughness, or resistance to fractures, comes from a unique configuration based on three different levels of hierarchy in the material's internal structure. The three-tiered structure makes it very hard for any tiny cracks to spread and enlarge, Gu says. The material has a "zigzag matrix, so the crack has to go through a kind of a maze" in order to spread, she says. Until recently, even after the structure of the conch shell was understood, "you couldn't replicate it that well. But now, our lab has developed 3-D printing technology that allows us to duplicate that structure and be able to test it," says Buehler, who is the head of the Department of Civil and Environmental Engineering. Part of the innovation involved in this project was the team's ability to both simulate the material's behavior and analyze its actual performance under realistic conditions. "In the past, a lot of testing [of protective materials] was static testing," Gu explains. "But a lot of applications for military uses or sports involve highly dynamic loading," which requires a detailed examination of how an impact's effects spread out over time. For this work, the researchers did tests in a drop tower that enabled them to observe exactly how cracks appeared and spread—or didn't spread—in the first instants after an impact. "There was amazing agreement between the model and the experiments," Buehler says. That's partly because the team was able to 3-D print composite materials with precisely controlled structures, rather than using samples of real shells, which can have unpredictable variations that can complicate the analysis. By printing the samples, "we can use exactly the same geometry" as used in the computer simulations, "and we get very good agreement." Now, in continuing the work, they can focus on making slight variations "as a basis for future optimization," Buehler says. To test the relative importance of the three levels of structure, the team tried making variations of the material with different levels of hierarchy. Higher levels of hierarchy are introduced by incorporating smaller length-scale features into the composite, as in an actual conch shell. Sure enough, lower-level structures proved to be significantly weaker than the highest level pursued in this study, which consisted of the cross-lamellar features inherent in natural conch shells. 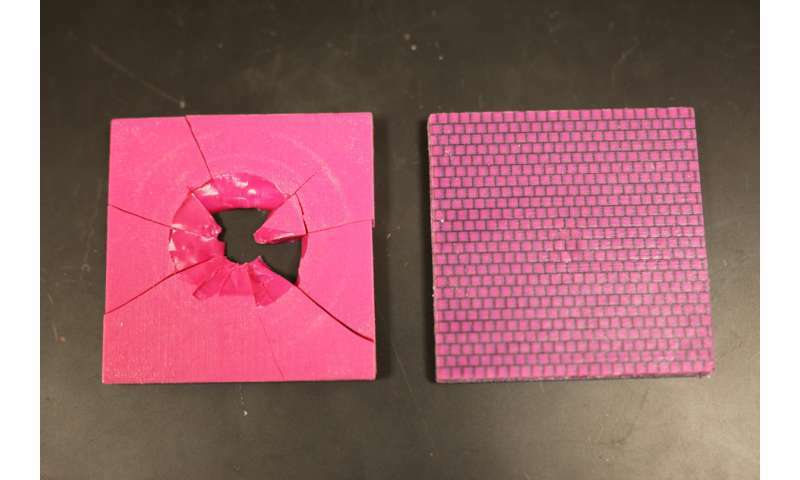 Testing proved that the geometry with the conch-like, criss-crossed features was 85 percent better at preventing crack propagation than the strongest base material, and 70 percent better than a traditional fiber composite arrangement, Gu says. Protective helmets and other impact-resistant gear require a key combination of both strength and toughness, Buehler explains. Strength refers to a material's ability to resist damage, which steel does well, for example. Toughness, on the other hand, refers to a material's ability to dissipate energy, as rubber does. Traditional helmets use a metal shell for strength and a flexible liner for both comfort and energy dissipation. But in the new composite material, this combination of qualities is distributed through the whole material. "This has stiffness, like glass or ceramics," Buehler says, but it lacks the brittleness of those materials, thanks to the integration of materials with different degrees of strength and flexibility within the composite structure. Like plywood, the composite is made up of layers whose "grain," or the internal alignment of its materials, is oriented differently from one layer to the next. Because of the use of 3-D printing technology, this system would make it possible to produce individualized helmets or other body armor. Each helmet, for example, could be "tailored and personalized; the computer would optimize it for you, based on a scan of your skull, and the helmet would be printed just for you," Gu says. The research was supported by the Office of Naval Research, a National Defense Science and Engineering Graduate Fellowship, the Defense University Research Instrumentation Program (DURIP), the Institute for Soldier Nanotechnologies (ISN), and the Natural Sciences and Engineering Research Council of Canada.